This is a fine 1956 U.S. Air Force aeronautical chart or map of the Middle Natuna Archipelago, Indonesia, located in the South China Sea. The map focuses on the Seluan Island and covers from the northern part of the Great Natuna Island or Natuna Besar north to the Prince of Wales Bank and Owen Shoal. The Seluan Island is part of the Middle Natuna Archipelago and is part of the Riau Island Province of Indonesia. The chart is highly detailed and notes data essential to the air pilot. Verso features legends and a world aeronautical chart index. 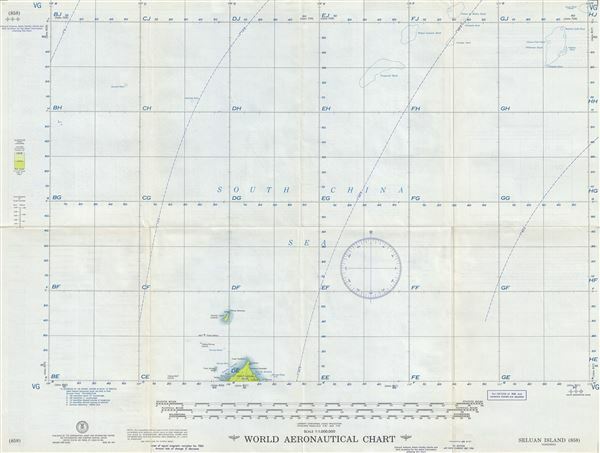 This chart was published by the Aeronautical Chart Center, and issued as chart no. 858. First issued in 1955, this is the fifth edition revised to Dec 1956.